Lack of site preparation: Pouring concrete is not a simple job, it’s one that needs significant preparation. Your site needs to be perfectly level and well-compacted or you’ll get an uneven surface. Thin layers of gravel can also result in settling. Sandy soil needs to have the sod and topsoil removed, while clay or loam soil needs an additional 6-8 inches of gravel underneath the new concrete. Mixing errors: Incorrectly mixed concrete is completely useless and you shouldn’t lay your concrete at all unless you are totally certain that your mix is correct. What’s more, different projects may require different mixes, so there’s no one-size-fits-all solution. Similarly, mixing too little concrete will compromise the quality of your result, while too much is just a waste of money. The best way to get the right mix and quantity is by using a volumetric concrete mixer. Not checking the weather: Very hot and cold weather will affect how your concrete sets and how quickly it sets, so you have to be prepared to work accordingly. Rain, however, can ruin your entire project, so you need to be prepared with a tarp n on hand to cover and protect your concrete even if the weather should be good. Forgetting the finishing work: Concrete needs to be screeded, edged and floated if you want a quality result. Without this finishing work, your concrete will look rough, messy and uneven. Any air bubbles can cause structural problems as well, compromising the durability of your finished project. At Artistic Concrete in Broward, we offer our clients top quality concrete flooring solutions that are stylish, durable and eco-friendly. Take a look at our gallery to see the great results we bring our clients. 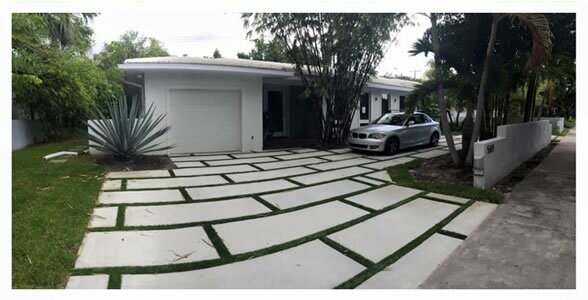 Our products include polished concrete floors, concrete patios, the top quality Uro-Tile range as well as Thin-Crete, concrete stamping, concrete pavers and micro-topping to commercial and residential properties in the South Florida-Miami Dade & Broward areas. With expertly trained, experienced teams, we’re concrete contractors who are able to offer our clients an affordable, efficient service. To learn more about our expert services, please don’t hesitate to contact us today.